What Happened to the 10 Neo-Pros For 2016? At the start of the year ten neo-pros were picked as riders to watch. How did they get on? The concertina player Gianni Moscon put the squeeze on his rivals several times this year. Team Sky often seems like a black hole for young talent where they have set leaders and everyone else riders in their service. Moscon seized his chances, he won the Korg Fjellet “summit” finish of the Arctic Race of Norway and duly took the race overall. 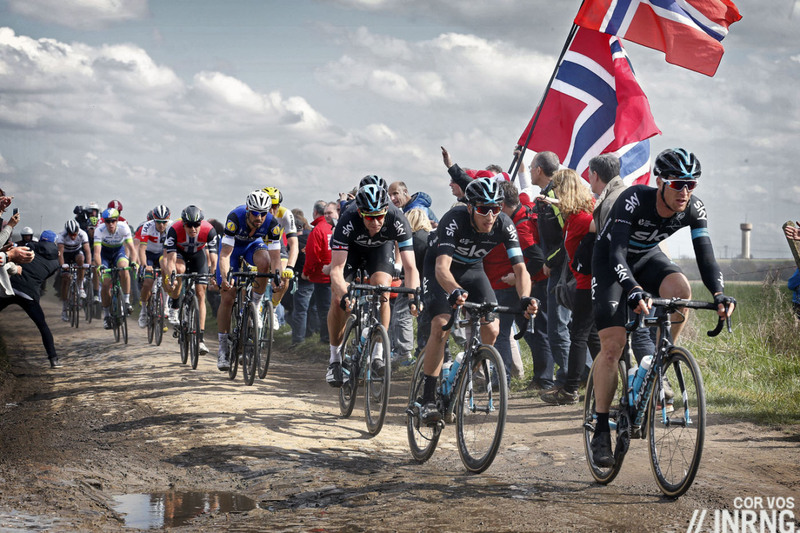 He was visible in Paris-Roubaix – second wheel in the image above – helping Ian Stannard notable perhaps for crashing out of contention late in the race along with Luke Rowe but this only shows he was present late into the race in an event that typically rewards experience. 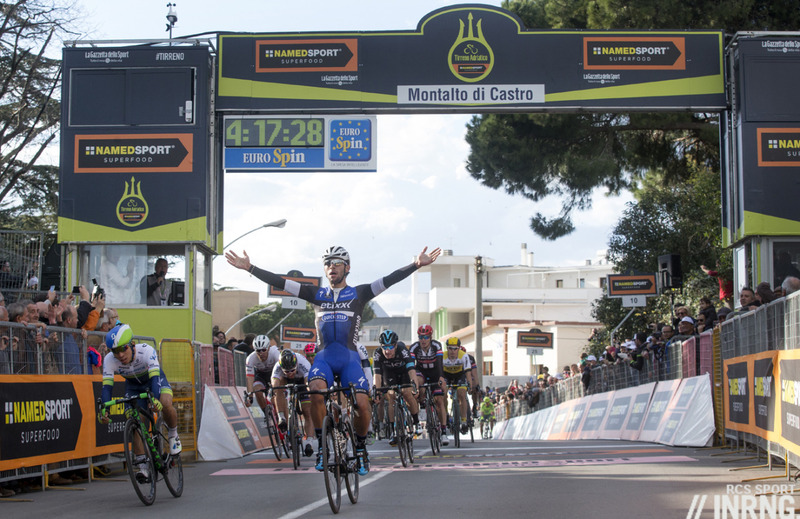 Italian cycling may struggle to attract sponsors but there’s a conveyor belt of talent and it’s easy to imagine a future where the likes of Moscon, Vincenzo Albanese and Filippo Ganna share the spoils of the spring classics. These are exciting times if you’re a Dutch fan with Tom Dumoulin, Steven Kruijswijk and Bauke Mollema. Let’s add Sam Oomen too, another musician who plays the piano and guitar in his free time and one of the rare young riders not to bother with social media. He made the podium in the Criterium International and then won the Tour de l’Ain outright after winning the Queen Stage. Sure he didn’t slay the world’s best this year but these results are right where he should be. 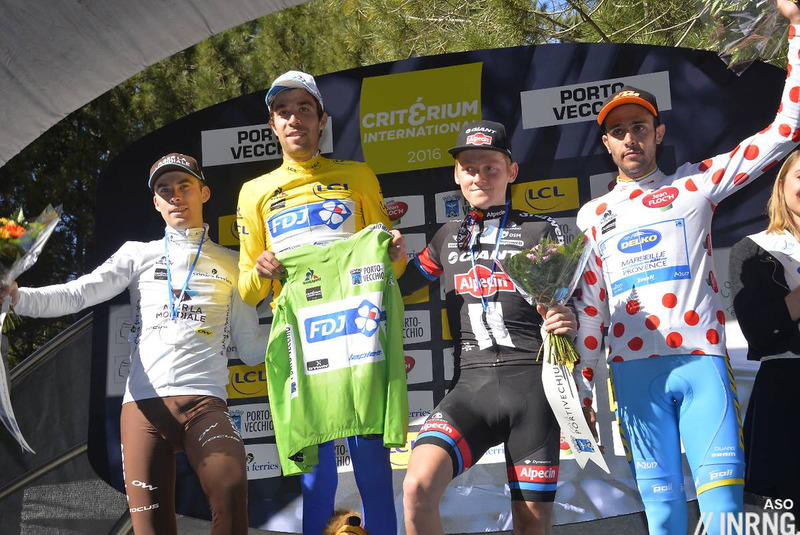 He was also 13th in the Tour du Poitou Charentes time trial, unremarkable at first sight but the field was stacked with a lot of specialists so the story is that he can climb and time trial. Fernando Gaviria was almost left off the list in January for being too obvious. However 2016 saw him flourish in the spring with a rare depth for a neo-pro. He started off with a stage win in the Tour de San Luis before going on to more wins including a World Tour sprint win in Tirreno-Adriatico (pictured) thanks to a late surge that left everyone else trailing. In total he took eight wins but proved much more than a sprinter with his spectacular and successful late attack in Paris-Tours. All this too with a focus on the Olympics as well. He crashed out of Milan-Sanremo in the streets of Sanremo but like Moscon above this only shows he was in contention for such an arduous race. Sanremo can be an fickle event: accessible for so many yet also very elusive but the Colombian is already a contender for La Primavera in 2017. Patrick “Paddy” Bevin had a great 2015 with so many wins and placings it was easier to count the days he didn’t make the first ten. He wasn’t so visible this year but the talent is still there, notably with his third place in the Paris-Nice prologue. “I took a bit of a beating” he told cyclingtips about his first season in the World Tour and he’s had injuries, a DNF in Paris-Nice after breaking ribs and another in the Vuelta after two crashes. He should be back for more in 2017 and if that “uphill sprint” niche is crowded these days by the likes of Peter Sagan and Michael Matthews expect him to strike sometime and possibly poach a prologue too. At first glance Søren Kragh Andersen didn’t set the world on fire but he did take some good results. He rode seven time trials and made the top-20 in them all which is quietly impressive, especially his fourth place in the Tour of California’s time trial stage and thanks to the TT stage – and the ability to hang in the front group in the crosswinds – won the best young rider competition in the Tour of Qatar. He can mix it in the sprints too but perhaps he had to this year given his Giant-Alpecin team have been struggling for sprinters given Marcel Kittel left and then the training crash took out John Degenkolb and Max Walscheid. The team, to be renamed Team Sunweb for 2017, are good at bringing on talent so Andersen should keep up the progress. Every year FDJ and Ag2r La Mondiale get to pick the best of France’s bumper crop of U23 riders but these big teams only have so many spaces to fill. Indeed Ag2r will be the only pro team will a full quota of 30 riders for 2017. So Guillaume Martin joined Wanty-Groupe Gobert, an unusual choice for a climber but he helped get the team an invite to the Critérium du Dauphiné. His season started with a knee injury but stayed stoic, perhaps helped by his masters degree in philosophy which means he’s happy to discuss Nietzsche and sports performance during an interview. He came good in the summer and finished second overall in the Tour of Austria and fourth in the Tour de l’Ain. Lennard Kämna turned pro by accident. He was riding for Continental team Stölting which merged with Cult Energy and suddenly stepped up a level. 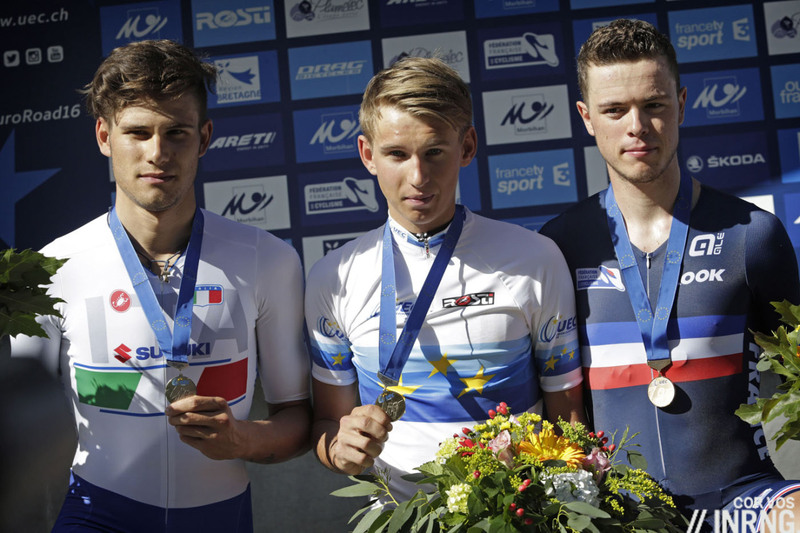 This might have been too much too soon for the 19 year old but he slowly progressed, fourth in the Tour de l’Avenir’s time trial stage before winning the European U23 TT title ahead of Ganna and Rémi Cavagna before placing fourth in the Worlds in the same discipline. He’s off to Sunweb for 2017 and while the likes of Ganna and Cavagna look destined to tract the peloton across cobbles Kämna’s lighter build suggests stage racing is a possibility. The Russian U23 ranks seem to have more meteors than the Kuiper belt. Igor Silin, Sergey Chertnitskiy, Petr Ignatenko, Ildar Arslanov and Aleksey Rybalkin have blazed their way across the U23 scene only to fizzle out in the pro ranks. 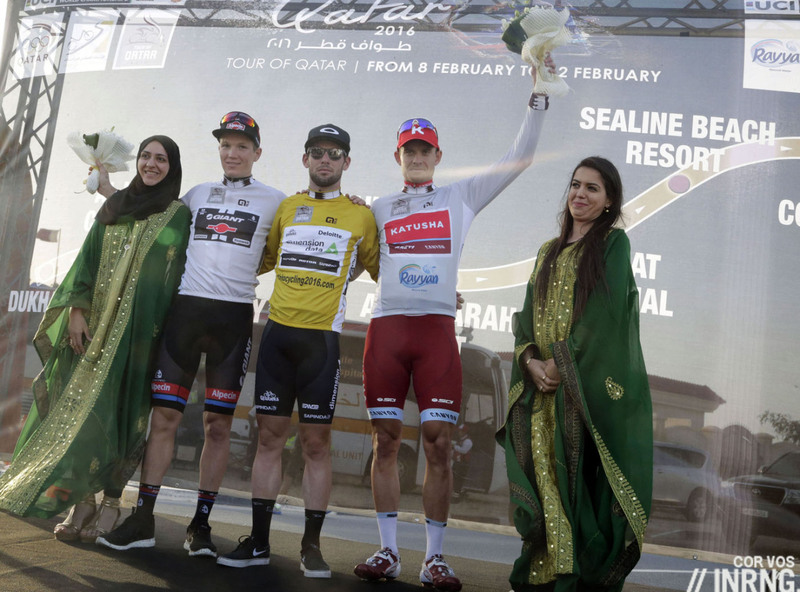 But Matvey Mamykin impressed as an amateur and continued to do so in his first year with Katusha. He won the best young rider competition in the Vuelta a Burgos and completed the Vuelta and crucially made it into some breakaways and was attacking on the mountain stages, all before finishing 16th in Il Lombardia, a very hard race. 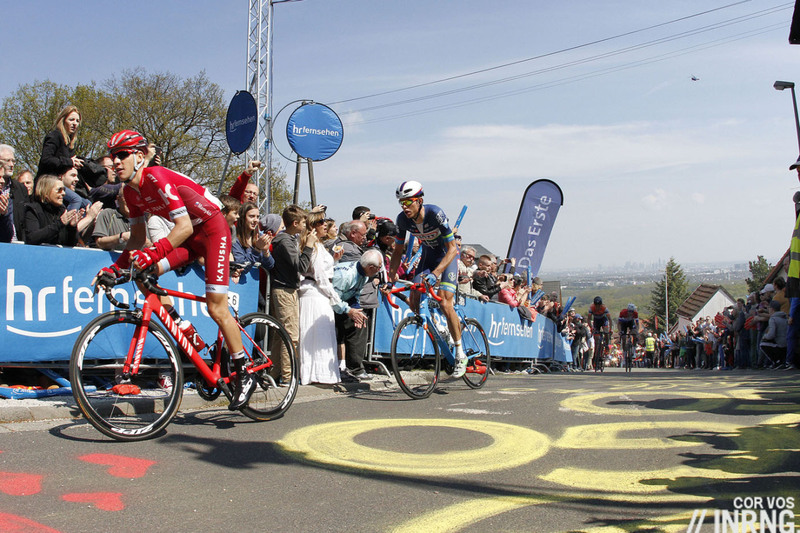 The Russian team wasn’t certain to continue but Ilnur Zakarin may have helped swing the balance with Mamykin helping further. Mamykin is the Stakhanovite of this piece with 75 days of racing in 2016. Alexey Vermeulen was cited because he seemed an odd pick, an American joining the Dutch team of Lotto-Jumbo but there’s a connection as the name implies with a Dutch grandfather and more relevantly many bike brands want an ambassador so Vermeulen was useful to team sponsor Bianchi. He’s been learning and should ride a grand tour in 2017. Simone Petilli was chucked in the deep end by Lampre management with a start in the Giro d’Italia which he did after a busy spring campaign. 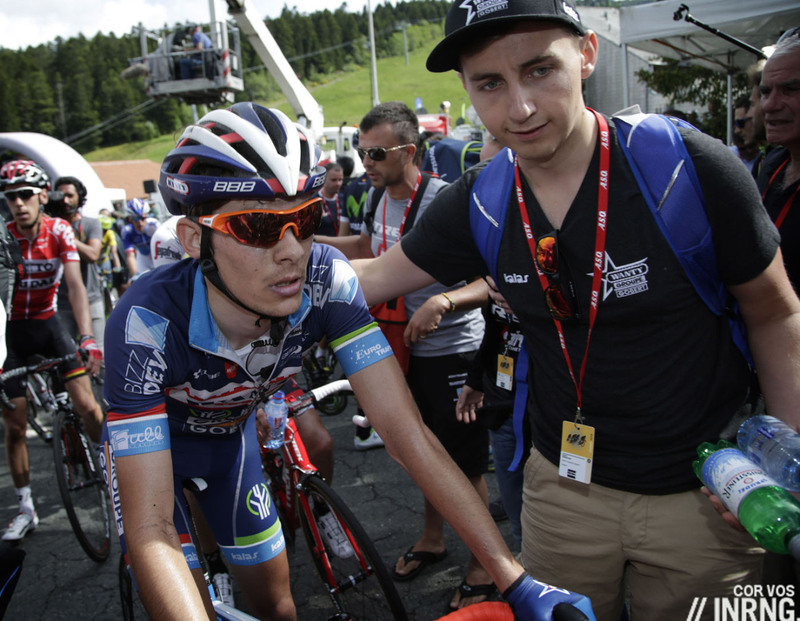 He didn’t get big results but played his part in helping Diego Ulissi win his first stage. 68 days of racing was a lot and lets hope his development isn’t rushed further now the Lampre team has had to find new sponsors in extremis from Abu Dhabi after the TJ Sport debacle with talk of a shrunken budget. Those were the 10 picks but the piece mentioned Robert Power and Jack Haig (Orica-Whatever) in parting and it’s been good to see Power recover from injury and if he’s technically still a neo-pro for 2017 he’s really a first year pro in other ways too. Davide Martinelli and Laurens de Plus joined Etixx-Quickstep and Martinelli had two wins including a stage win in the Tour of Poland. Lilian Calmejane (Direct Energie) was cited as a “potential classics poacher” and duly won a mountain stage of the Vuelta but still has his eyes on Paris-Roubaix. Wunderkind Silvio Herklotz (Bora-Argon 18) is still 22 but not translating promise to results while Toms Skujiņš (Cannondale) delivered a precious stage win the Tour of California. “Orica-Whatever” – Orica Scott? Or are their rumours of another change? Exactly, and Quickstep always was just Quickstep, no matter what co-sponsor they had. Haha, touche – I was still in diapers when it was called Mapei! It would make more sense, from a marketing perspective, if the team name, remained static. Marketing partnerships come and go, more so within cycling. Scott – after the demise of IAM needed a team, and with GreenEDGE winning on most terrain and differing races, it made sense, to increase their options. 5m euros a season is quite an investement. So they became Orica Scott. or it might have been misheard as ” Rippa Scott” ? Gerry Ryan – the major backer of GreenEdge – has some financial association/ownership of Bike Exchange through their parent company Marketplacer/The Exchange Group, so having Bike Exchange as a ‘co-sponsor’ isn’t much different than using the GreenEdge placeholder. It’s just a less direct form of personal sponsorship, similar to Mitcheton winery being a minor sponsor of OGE – it’s Gerry Ryan’s winery. All this is much better than putting you own face on a jersey like Alexander Vinokourov! And we’ll have to get used to another name next year because Orica is going. Great summary Inrng – your predictions were really accurate. Gaviria especially impressed the world this year. He looks to become the typical young Quickstep superstar-in-the-making. It will be interesting to see his progression over the next few years as the top sprinters hang up their wheels or transition to road captain status. Boonen is retiring in 2017, Greipel is 34, Cavendish is 31 and Kittel, Sagan, Degenkolb and Matthews are surely at their peak – which means the next 5-7 years will have a lot of races for young guys like Gaviria, Caleb Ewan, etc. A thoroughly enjoyable article and an excellent hit-rate on the picks, INRNG. Amongst those cited outside the 10, Laurens de Plus deserves extra props for his job as bottle carrier for the Belgium team in the Olympic Road Race. Van Avermaet was quick to drop his name in as playing a key role in his win. Good memory. So many of these roles can be forgotten over time, we will remember GVA won gold but the how and the who will fade over time. Would have been interesting to see where Moscon finished in Paris-Roubaix had Sky not fallen over themselves late on. He seems built for such a race. The photo’s suggestive isn’t it? He’s there in the group with Boonen, Hayman, EBH, Vanmarcke. But if I don’t point it out someone else will: he might have been so tired and weak by that point that this caused him to crash, we don’t know. 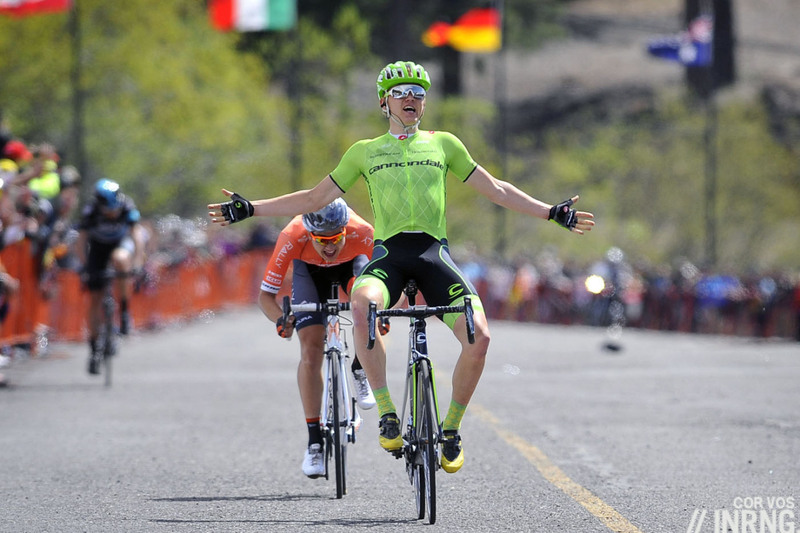 He’s from the same region as Franceso Moser so comparisons occur and his summit finish win will only encourage more. He’s staying with Joker, no? The neo-pros picked come from the World Tour and Pro Continental teams.